This description of Section 12 of the Camino (3.7 kilometers, roughly 1 hour descent, but 1+ hour ascent) maintains (as in prior sections) the point of view of a hiker traveling from North (Creel) to South (Divisadero). It starts at the top of Cerro Alto (Spanish for “High Mountain”), the highest point in the area at 2,480 meters (approximately 8,100 feet). As discussed earlier in the guide for Section 11, the tourist center of San Luis de Majimachi (largely unused in 2016) at the summit of Cerro Alto offers outstanding views over much of the Cobre region. The Camino descends along the sides of the mountains toward Divisadero 250 meters below, offering very good views to the east (on the left of the hiker traveling south). 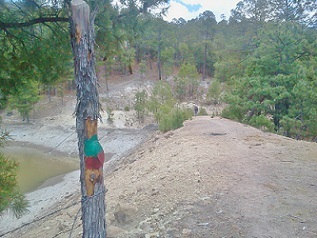 After passing a small Tarahumara house and farm, the last 1.5 kilometers go through the trees to a small reservoir and along a forest path to the Divisadero train station. The Camino begins on the north side of the Handicrafts Center (“Centro Artesanal”) – no longer in use as of 2016 – amid the trees on the southeastern edge of the Cerro Alto mesa. It goes 20 meters down a concrete staircase directly east before turning a hard right on a clear path that goes straight south toward Divisadero through scattered trees and rocks. 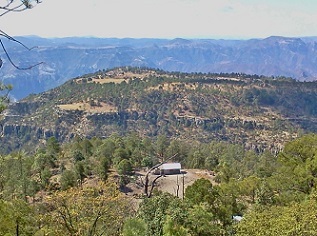 This upper part of the section (approximately 500 meters) is generally on the south-facing slope of the Cerro Alto mountain with very good views over the canyon system to the south. It descends steeply on a series of switchbacks that overlook 2 to 3 Tarahumara farms and houses 50 meters below on the left. 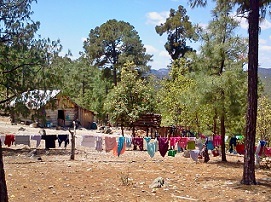 It passes through an old wooden gate approximately 350 meters from the start, staying to the left of another Tarahumara farm visible through the trees on the right. 600 meters from the Cerro, the trail descends to a saddle and rises slightly to a good, almost flat trail through the woods on the South- and East-facing slope of another nearby mountain. 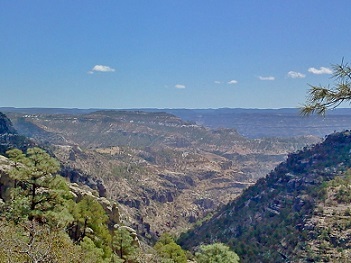 Views over the canyons to the East (left) are very good. At times the trail is somewhat rocky, but in good condition. It goes through another wooden gate (900 meters from the summit) before entering a wooded area. At 1.1 kilometers from the start, there is an important junction where the hiker must take care to follow the markers over an area composed nearly entirely of large flat rocks. The trail bends slightly to the left as it descends from the trees. On the right the hiker can see a small rock dam or bridge in a rocky ditch. The Camino does not cross this dam, instead turning left 10 meters before. At this point the trail again offers very easy walking, descending very gradually on an east-facing slope. Canyon views to the left (east) are very good. 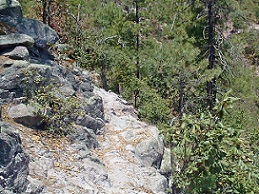 The trail occasionally is rocky and narrow with short, steep up-and-down sections. 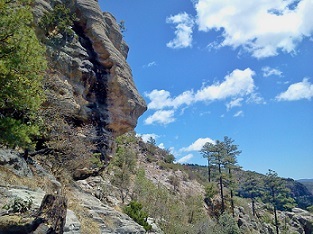 Local Tarahumara continue to use the trail frequently and safely. 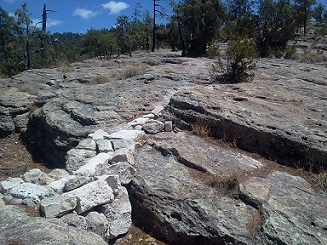 However, Camino hikers (who are not as familiar with the trail as the Tarahumara) should take care to maintain their footing in these sections. After 600 meters on the portion with good eastward views, there is mini-mirador (viewing point) from a prominent rock along the trail. Hikers may look back up to Cerro Alto 150 meters above, as well as the canyons to the right (east). In this section the Camino continues on the side of a low mountain on its right. Approximately 2.0 kilometers from the start the trail passes under some large overhanging rocks on the right side and uphill. In another 200 meters after the overhanging rocks, the trail leaves the best viewing section of the Camino as it comes to a flat saddle below the mountain. 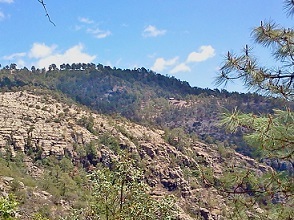 At this point it enters some scattered trees near another isolated Tarahumara farmhouse (2.3 kilometers from the start). To avoid disturbing the Tarahumara inhabitants, the Camino passes 40 meters to the left (east) of the house and takes a long side path through the trees. Approximately 50 meters away from the house to the South, the trail makes a sharp right turn, again through the trees, to begin a cross-slope switchback. It descends steeply through the trees to the reservoir providing water to the hotel in Divisadero. The Tarahumara house is increasingly above the Camino on the right. 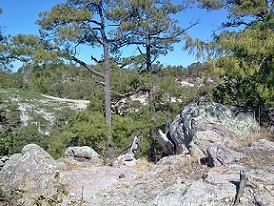 The trail is narrow and often composed of crumbly rocks and earth. Hikers should be careful to avoid falls in this section. After arriving at the reservoir, the Camino turns left and follows the water’s eastern edge (depending on time of year, the amount of rainfall, and water level) toward the dam. It bends right at the dam to cross to the other side of the reservoir by means of the dam’s overflow wall. The stone-and-concrete wall itself is 0.75 meters wide (2.5 feet), and hikers may easily walk along the top of the wall. Alternatively, again depending on water level, it may be easier to walk immediately to the right of the wall, or descend further away from the wall to the left. After the hiker crosses the water channel (according to water level and the individual’s preference), the Camino resumes on top of the dam itself. The main part of the dam is 5 meters wide and flat and easy to walk on. The dam is 2.7 kilometers from Cerro Alto. After passing the dam, the Camino bends right for 20 meters along the water, then sharply back to the left in a hairpin turn. The trail from this point heads roughly south toward Divisadero. It is often in good condition with rock walls on the downhill side. In other areas it is a good forest path on the dirt. Highway 77 is not far on the right. At 400 meters from the dam, the Camino passes an opening immediately alongside the highway. However, it does not cross the highway but bends left to run parallel to the highway (5 to 10 meters away on the right) for another 400 meters. At 3.5 kilometers from the start of Section 12, the Camino intersects a public road providing vehicle access from Highway 77 to the Tarahumara community at Mogotavo. 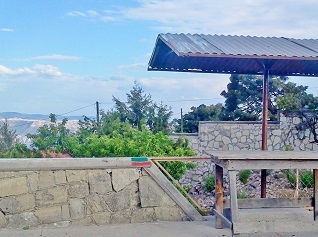 Hikers may wish to turn left at this access area to visit the Mogatavo mesa where the local Tarahumara community offers a system of hiking trails and a cultural center (as of 2016). It is approximately 1.5 kilometers from the highway to the community along a public road (4 WD). See the discussion of “Suggested Day Hikes” for more information. The Camino bends right as it meets the Mogotavo road and then crosses the highway. Directly across from the Mogotavo road is a well-used path through the trees in an area between Highway 77 (to the left) and the railroad (to the right). The Divisadero train station is easily visible on the left. Hikers should follow the path to the left approximately100 meters, descending gradually through the trees to the station. The Camino ends on the northern section of the station platform. After 150 meters on the platform itself, hikers will encounter the section devoted to food and handicraft stalls of vendors. Markers on the platform wall next to the vendor stalls indicate the final destination on the Camino. It is 3.75 kilometers from the start on Cerro Alto.